Planning a wedding is a busy time. The list of things to do and remember is endless. From organising wedding attire, flowers, transportation, booking the church and venue, as well as booking a photographer and videographer, I could go on. The cost of your special day can easily soar beyond your budget so it is a good idea to try and cut costs where you can without compromising your big day. One of the key places to save money is in the production of wedding invitations. Nowadays many couples opt to create their own wedding invitations. We have put together a list of some useful tips to help you make your own wedding invitations that will stand out from the crowd. • If you want to create a truly special wedding invitation we recommend you use handmade paper. Handmade paper adds that extra something to any piece and will look truly special. To make the invite, use custom card in a colour that suits the theme of your wedding, cut the handmade paper into a size just smaller than this, perhaps a 2- 3 cm border and stick it on top. To complete add a text layer that you can print off at home and chose your favorite font and text. • Why not use simple stamps to easily add a bit of life and a lot of personality to your website? Find a stamp that portrays your personality or is relevant to the theme of the wedding and stamp away. When the ink is dry it is a good idea to add some colour to your stamps with the use of coloured pencils. Chose an ink colour for your stamp that is similar if not the same as your font for consistency. 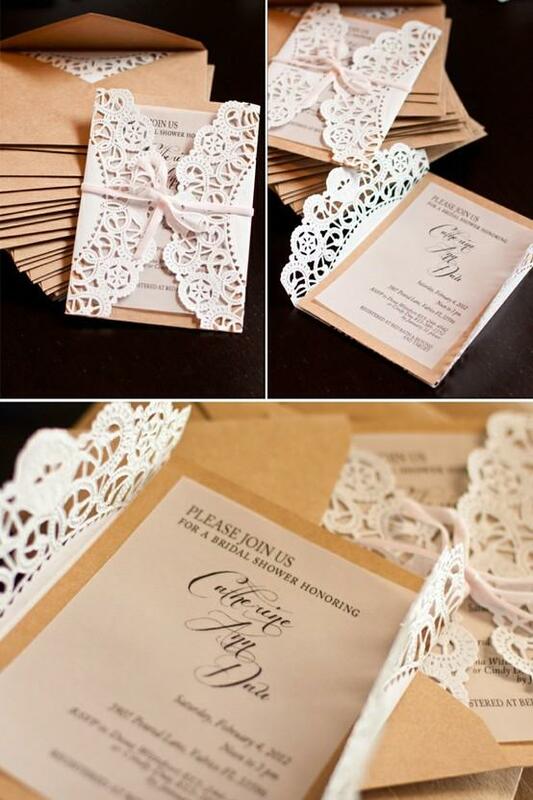 • A great way to produce a simply elegant invitation is with the use of lace. Cut lace slightly larger than your card stock. Spray it with adhesive glue and stick to the card. Trim the edges to ensure it is nice and neat. This is the perfect way to create a classy invitation. For the most classic look, chose monochrome colours, keep it classy. • If you care to add some colour to your invitation take a trip to your local arts and craft shop to see what scrapbook patterns and designs are up on offer. Using a die- cut is a great way to add colour to a card. To make an invitation print off your text later and back it with coloured card, you can glue your die- cut invitation for a fun and energetic look. • For a simple way to add style to your invitation add ribbon that matches your colour scheme. Hot glue the ribbon to the card stock and wrap it around to create a clean line, attach a backing layer to ensure that the wrapped ribbon is not visible.